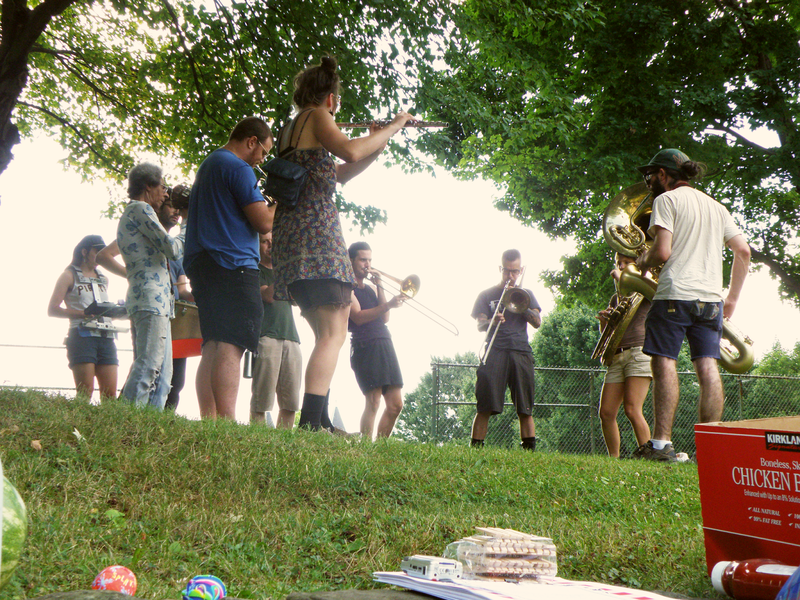 August 3rd 2014 was the return of the Roboto Punx Picnic. It was held at Arsenal Park in Lawrenceville because there seemed to be some disconnect with people coming out to Flagstaff Hill in Oakland. A lot of acoustic acts and some bands played. We had food and some outdoor games to play; I brought some board games in case it rained, and we went back to Roboto. It rained, but only for a minute. The May Day Marching Band played semi-impromtuly above where most of the picnic stuff happened. It was loud and awesome. At some point the band drifted off. Ramona, aka Madeline Hyer, played some ukulele stuff. 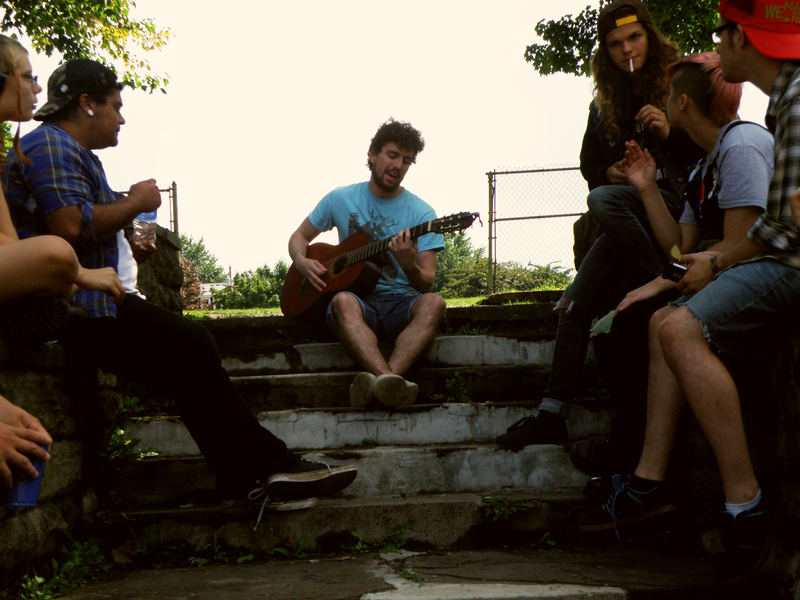 We had a lot of acoustic people play that I don't remember because I was stressing out a lot. Earlier on Stew and I had to go to Shur Save to get drinks and cups for the picnic, Stew had to go get the grill with Jon, and Stew and I had brought my PA for the electric bands. Jeremy Flynn was the last acoustic act to play. He's really great; a lot of the younger crowd gathered around the stairs to hear him. My band, Secret Paper Moon, played afterwards. We had played two shows before, but a lot of people had not heard us yet. I'd been spreading the word around about the band beforehand. 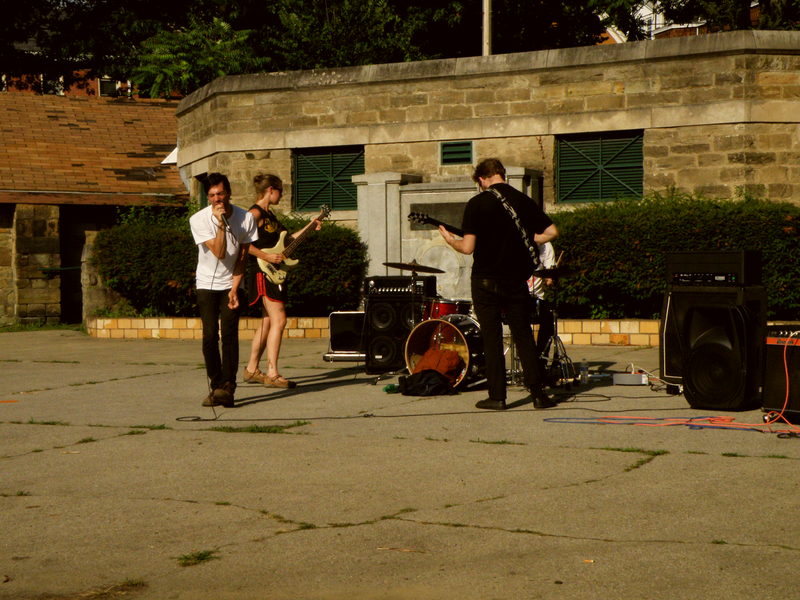 It surprised people that we weren't some kind of experimental/improv/noise band; the audience expected Satyr/Elfheim. They were surprised to see me playing the drums. We played a short set and closed out with Pink Floyd's "Wish You Were Here". Jeremy Flynn described us as "like Beat Happening meets Boris" which was just perfect. Wealth played after Stephen Lin read his poetry. Some young kids, around ten years old started to mess with the equipment, yelling into the mic and hitting the drums. I thought they were annoying, but ultimately harmless. Tyler McAndrew and I told them to stop since Stephen Lin was still reading poems, and they did. Wealth was sooo loud! It was awesome to have bands playing in the park. It reminded me of a picture of the band Carsickness I had seen of them playing in Market Square downtown; it seems like things like that never happen nowadays. Despite some parents packing their kids up, it didn't seem like there were any real issues with Wealth playing so Stew and I went to Roboto to unlock the door for Maggie Negrete's Zine Fair Fundraiser. We got to Roboto, unlocked the door, and set up some tables. I rushed around and almost hurt myself. We got back to Arsenal Park just as Dumplings were finishing up. Stew and I cleaned everything up to head back to Roboto, and I found out that my Zune was gone. Someone had gone into my backpack that had been placed underneath a table. Apparently it was one of those kids from earlier. Nobody had really noticed with everything else going on. We went back to Roboto. I really didn't want to be there. Stew and I unloaded our gear into the space because we didn't want to leave it in the car; this was the fifth time today that we moved the gear. We had loaded it into the car, out into the park, back in the car from the rain, back out of the car to the park when the rain stopped, into the car again after playing, and now into Roboto. We would even need to move it again to go home! I felt like I was losing my mind! I'd lost my Zune, and I was completely exhausted, but now I had to supervise a show. Some chairs got thrown around, and I left for a while. I saw Pam, Jon, and Jay in a car. They handed me a guitar that they thought I had left at Arsenal Park. It wasn't mine, but it looked like Ken Kaminski's from Wealth. I told them I'd take the guitar to Roboto, but I figured that doing so would make me feel more overwhelmed so I told them that they should do it. When I got back to Roboto I ate pizza with Stew, and called/texted Tyler that Ken's guitar was at the venue. After waiting outside and eating, I came back in and finished up the show. Shaky Shrines performed a great set! Their vocalist is amazing, and they always remind me of Hawkwind. I ended up buying another Zune, and I still feel bad about freaking out.